Nancy Paulsen Books, 9780399546198, 40pp. Meet a left and right foot who are a pair of complete opposites! Full of clever, giggle-inducing details, this lively odd-couple tale celebrates what makes us all unique, as well as the power of friendship to bring us together despite our differences. Feet come in twos, so they need to step out together. But Les and Ronnie often find it hard to cooperate. Les likes having a clean sock and being responsible. Ronnie is fine with a dirty sock and loves letting loose. 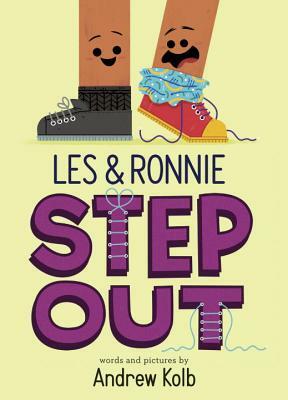 Les is straight-laced while Ronnie doesn’t even care about laces. What’s a duo to do? Andrew Kolb (www.kolbisneat.com) is an illustrator, artist, and designer. His first picture book, Edmund Unravels, was a Canadian Children’s Book Centre Best Book for Kids and is featured in Ontario’s “Let’s Read!” campaign. Kolb received his bachelor of design degree from Queensland College of Art in Brisbane, Australia. His work has been featured in numerous galleries, exhibits, and publications, and he has collaborated with clients ranging from start-ups to major television networks. He lives in Kitchener, Ontario, Canada.